I don't know if African-Americans feel the same way -- but for whites, I think he's colorless. You don't notice that he is black. So he might as well be white, you know what I mean? An idealist would hope Barack Obama's presidential candidacy would spur valuable conversation about race and identity in America. So far, however, the media seems mostly diverted by the horse race, and a subtle agenda to "expose" a mixed-race Obama as "not black." [D]irectly mirroring the traditional definition of whiteness as not being black is the growing tendency to define blackness in negative terms--it is to be not white in upbringing, kinship or manner, to be not too at ease in the intimate ways of white Americans. Out of the starting gate, media attention is mostly focused on Obama's "lack of pull" with the black electorate and specific leaders. (Obama's Appeal to Blacks Remains an Open Question -- WAPO; Clinton, Obama Vying for Black Power-Brokers - NY Observer). From The BAG's standpoint, however, what is fascinating is how the visual press is effectively coloring Obama as either a racial misfit or a "closet white man." Take the shot above, for example (taken in good old Fairfax, Virginia). As a study in extremes, you have Obama framed between a white, white, white-haired white guy on the left, and two very dark African-American's on the right, both even darker for the shadows. And "which way" does the candidate go? In this editorial selection, you have Obama reaching out to and being embraced by a white audience, while the black man is either in his employment, running to catch up, or having to crane for a view. 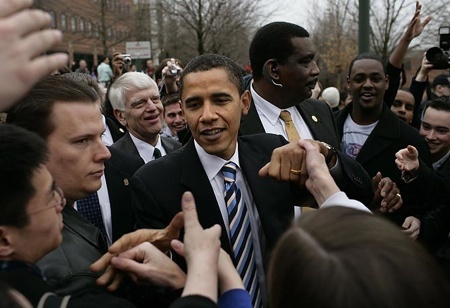 If you want an even more skewed example (a painful one, if you ask me), look at the pic that accompanied "So Far, Obama Can’t Take Black Vote for Granted" -- the "Obama and the Black vote" offering from the NYT. Descending the white marble stairs in the halls of Congress, Obama is framed by a white reporter and a white Senator, wearing a bright white shirt against a grand gold-framed portrait of the (white) founding fathers (partially obscured by the white glare). And that story was about what, again? With the media doing the leveraging, it seems Obama's racial integrity can be questioned without fear of flak from either the African-American left or the hate-mongering right. The result? We are mostly stuck with the preoccupation with what Barack is not. When it comes to politics, are we so far behind we can only do black-and-white? Americans have "island" mentality - the result of a narcissistic personality. They are really afraid of him, aren't they? (Mrs. Clinton, McCain, and all the rest of the pack on either side. If he won, it would, at last, truly, empower men(especially) of colour. Speaking of which, a lady I know well once described herself (African-Nicaraguan mixture) as "coloured." Maybe, we were better off with that description, if we felt we just had to have a description. Since moving to the Middle East, I've often been struck by the artificial view of race in the U.S. Just as you said, it's seen as only black and white. This photo does make it look like the blacks are being ignored, while the whites are reaching out to him, and he's reaching back. Every presidential candidate has to be concerned about their every move and every statement, but every step must be even more of a minefield for him. Is he too close to the whites? To the blacks? Did he got to a "madrasah" - i.e., school? Actually, the two guys on either side of him - the white guy to his left and the black guy to his right - seem like Secret Service agents. As a cold political calculation, the idea of Obama as "clean" and "colorless" (and let me note here that even seeing the name of Glenn Beck makes me want to throw up) might help him among non-blacks. Not to mention among the kind of well-heeled donors (of any race) that he needs to hit up for financial donations. In fact, the idea that blacks don't support him as much as they do Hillary might be helpful, too, among some groups of voters. I've seen comments like those in this article, saying that his background doesn't qualify as authentically "African-American" for some African Americans, one reason being that his ancestors weren't slaves. I'm not black, but I don't get that, and I question whether black voters would decline to vote for him in the primaries. In the general election, I can't imagine them voting Republican against Obama. What does "good old Fairfax, Virginia" mean, though? Fairfax isn't exactly like the Confederate south. I'm concerned about these implied "rules" of ethnic identification and enforced behavior in the (dis)United States. How does one "act black"? What makes a person "black enough" and why does the MSM tell us that it matters so much? There seems to be this easy-to-swallow perception in this country that there is one valid, single-dimensional representation of ethnic groupings, i.e. white = rich, privileged, better and black = poor, uneducated, angry. No one is that easy to peg and the reasons this resonates so well here are much more subtle. My observations and experiences tell me that these distinctions are often more about color and class-based economic divisions - group control lessons absorbed long ago (and unconsciously perpetuated) by many African-Americans. For their part, older middle-class whites accept this version of reality as "something they do to themselves." What happened to Dr. King's vision of being judged by the "content of one's character"? I've traveled around the world and have interviewed many people from all strata. It's just skin, people. It matters so much more what a person does in the world than how he appears to the world. There appears to be an effort underway to marginalize Obama's candidacy by focusing attention on his race while ignoring the substance of his message. It's difficult to discern if this tendency constitutes a conspiracy since mainstream media in the U.S. always emphasises style (or the irrelevant) over substance. This was taken at George Mason Univ. The white man behind him to the left is the president of the univ. Those surrounding him are students. Probably the guy in the suit directly behind is security. The picture shows his appeal to students, how comfortable he is in an academic setting, and there is that eager, youthful look on his face that is a big part of his charm. I would like to hear what the many people of mixed race ancestry have to say about Obama. lowly grunt: I am one of those people considered "not quite black" so my previous comments are not merely academic, but informed by my own life experiences. Mr. Obama is not unique from the nationality / ethnicity perspective in my opinion. Is there anyone besides Clarence Thomas who's "black enough" for Glen Beck? La Cabeza Grande, that's what I'd like to hear from the MSM; Obama isn't unique. I used to live in Dayton, OH and my children were the only white children in our neighborhood and in their school. It was interesting to hear my daughter and her friend next door talk about other kids in their school as being either, "black", "white", or "mixed". Kids know that there are spectrums of color and race, why can't adults? I apologize for not saluting you properly, La Cabeza Grande. Glen drew my attention and let me to comment about him in my podcast: Colorblind or just blind? 1. La Cabeza Grande et al. - MLK pre-dated Affirmative Action; gotta distinguish skin color to enact Affirmative Action quotas. 2. Colin Powell and Condi Rice are both of Caribbean ancestory; therefore, they are 'honorary whites' - black in appearance, but with values more closely aligned with white Americans than most other American blacks. Q: Do mixed-race people get affirmative action preference? Jeez, this whole conversation is kinda sick. But it is all about class and race, isn't it? Class struggle and racism. The over-privileged and the under-privileged. I am from "Caribbean" ancestry (I am Puerto Rican) how does that align my thinking or anyone thinking with a certain population of the U.S.? A very vivid image for me is when Tavis Smiley read Obama's apology for not appearing at this year's CWBA event which was held in conjunction with the Jamestown Project. There were more than a few scattered boos from those in the hall. But then again, the symbolism of Obama choosing to kick off his presidential run in Springfield instead of attending the CWBA demonstrated to me the wide gulf between Black and White American. After all, how many White Americans have any notion or even idea of why Obama should have attended much less read the meaning of the CWBA acronym. Sorry Lima - I meant to say Jamaican, not Caribbean. Jamaicans are well known to have a better work ethic than most American blacks. I have thought about why the media is so obsessed on Obama's race. They want to trivialize him by running pictures of him on vacation swimming with his daughters as some pinup, set up all this Clinton was the first black president and that blacks do not accept Obama as black, always asking for his positions on things while ignoring it with other candidates. But, most of the msm is from New York. They dream of a inter city race between Hillary and Guillianni. I noticed how they dismiss all the candidates except for those two who they proclaim are the nominees even though it is a year out and we, the voters, are the ones to decide. The msm screamed headlines because Clinton got two low level local politicians who are black to endorse her. They made it out to be like See, Obama is not liked by the black community! Maybe the problem is like with non black voters. Everyone knows Clinton but, few outside Illinois are familar with Obama and are waiting to see what he is like and what his positions are. Now the msm is complaining because Obama decided to answer his critics and put some policy in with his speaking. They say all energy is drained when he isn't giving the inspirational speech. And when he does they complain that there is no meat. What the hell do they want. Some is planted by the Hillary campaign and some is just the media wanting to throw off the serious threat of the Chicago guy from the dream series like it's the world series. Since Obama is the first black candidate to have a serious chance of being nominated, I don't think it's unexpected that the media focuses on his race. We can discuss how they handle it, but we can't expect them to ignore it. Without him in the race, there might have been more of a focus on Hillary's being a woman, but there hasn't been so much of that, has there? Maybe they got over that with Pelosi? It's really inspiring to see him in the race. I think black people can say that WITHOUT getting behind him politically, yet. I mean, do they think black people are dumb? (yes) do they think that we'll just vote for any brown person they can find? Jesus! You can feel inspired to see that this guy has a chance, but still at the same time want the room to make up your mind about the politics... but, I guess this is 'too nuanced' for the media to express. Oh and on the mixed race issue... who suspended the one drop rule? Is it retroactive? The black population in the country is gonna fall by like 1/3 overnight. Tons of black people are mixed, recent or in the past, now that Obabma's kicking it up this matters? Is Jesse all black? Is Sharpton? I don't think so! I'm yet to hear anyone question his "blackness" in the black community. I'm disturbed the the media are doing this. It is interesting to view the "Is Obama BLACK" debate from France. The USA and France have taken opposite approaches to the issue of minority populations. In the US, when the white population finally came to regret that they had systematically oppressed 12-14% of the population because of the color of their skin, the federal government began collecting statistics on race and encouraged affirmative action to correct the unfair playing field. We have tried to create a multi-cultural society in which the values and customs of all groups (ethnic, racial, religious, sexual orientation) are equally respected. In theory, all the systems are in place to ensure that no one is discriminated against based on race, religion, gender and so on. In France, when the Christian population realized that they had cooperated with the Nazis in identifying and murdering French Jews, the government banned the collection of all statistics on race or religion and intensified the efforts by the State to create a common French culture characterised by language, history, culture. In theory, having adopted the language, the customs, etc. one is French and equal. Obvioulsy, neither approach has worked perfectly. In the US, some cultures are self-defeating. In France, not everyone wants to be French and not all French are color-blind. I look at Barack Obama, and I see a very attractive, accomplished, eloquent individual. Though his father was African, Barack Obama is an American of the dominant culture, a culture that has been defined by the majority population, and that majority happens to white. So the media just don't know what to do with him. He breaks the narrative line. He is not an up from poverty and discrimination African-American. He is not a white American. I'm not surprised that the African American culture is ambivalent, because the clear message from the dominant culture is be like Obama. Anyhow, it is exciting. It is a challenge. Maybe the media will be able to come up with new story lines. "Blackness" doesn't just have to do with skin color. Once upon a time there was a black politics in the US. Obama does not belong to that tradition. No one is going to mistake him for Malcolm X or Huey Newton. In that sense, he is just as white as Colin Powell or Condoleezza Rice, both white devils. Our lives are filled with people of different religions, races and cultures and we value it more because of expanding our personal "borders" of experience and relationships. That is why whether Barack Obama is black or white is not so important. That is why the fact that his mother bore him with an African, raised him in the Pacific and in Asia are important. And that is why even MItt Romney's religion is NOT important. Let us get to the substance of values and actions, and beyond superimposed, single variable markers of identity. I think that is why I passionately support Barack Obama. Like many Democrats I fear my own hope. Here is yet another candidate (McGovern, Dean, McCarthy...)that reflects my values but not those of "most Americans." As if I were better. In my experience, barring the fact I have not spent time with many current and former members of the Ku Klux Klan, people gravitate towards the comfortable and are converted by the inspiring. You can find a person of any age who spends his or her days in a small circle of comfort tell you a story with great excitement of meeting someone different and unique, not like themselves at all, and with great admiration. But they must meet them in a comfortable space. And, most of all, they must feel trust. That requires that they not be challenged on their own comfortable values, but attracted to new ones, or at least to the person who cherishes values different than their own. That is the brilliance of Barack Obama. When he speaks, he does not belittle those who are different than he is and who do not share his values. He does not even speak of them. He does not threaten. Rather, he uses the word "we" and paints a vision of marching with him to a new era. Flowery, perhaps; idealistic, definitely. But effective, nonetheless. So, those who believe the people actually love to live without borders, welcome to this blog.